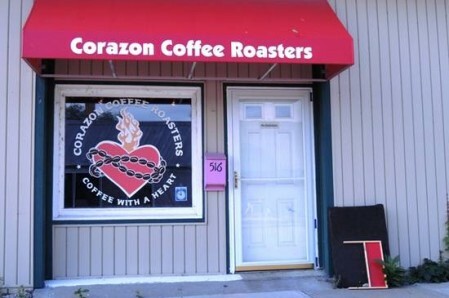 Corazon Coffee Roasters is a locally owned, organic and fair trade certified coffee roaster. We provide small batch roasted coffee, as well as high quality loose leaf organic teas. A variety of coffee and tea related items are available in our retail shop as well. You can even grab a cup of brewed coffee, toddy or an iced tea to go! We believe in providing the best organic and fair trade certified products at reasonable prices. We are a green environment, using all compostable paper and plastic products, in order to minimize our footprint on the Earth. Corazon Coffee Roasters is dedicated to providing the ultimate customer service, as well as giving back to our community. Hence our catch phrase “Coffee With A Heart”.